Could you, please, briefly explain how to trade on your platform? Anastasia: As to the beginners, I think you should first decide on your trading style: Do you want to achieve your results quickly or are you more of a strategist? In the former case try out binary and digital options. However, if “patience” is one of your qualities you can try Forex, cryptocurrencies or CFD with IQ Option. The rest is not difficult to guess. After choosing an asset you will make an assumption of in which direction the chart is going to move based on technical and/or fundamental analysis . Then you press PUT or CALL (BUY or SELL) and check whether you were correct. As an aid in the early stages, you can use our great video tutorials available at our website and a superb blog updated every week. What are the factors influencing trading? Anastasia: Obviously, it is the global economic situation that influences the markets. Listening to the latest news each day, we are getting a picture of what’s going on in the world. What about China and the USA? Did they strike a new deal? Tsunami in Japan? Did Putin take a firm stand at a global summit? These are the news headlines that affect the behaviour of the assets. Not everything relates to politics, news about multinational corporations are relevant, as well. Those of you who don’t feel like watching CNN in the morning can use our own news coverage. Simply look up into our economic calendar. Is IQ graph manipulated in some way? From time to time, I hear from the traders that they find it somewhat strange. Sometimes people ask me whether my practice (demo) account is free and how long I can use it. Are the two graphs – on the demo account and on a real account – identical? Anastasia: The account is absolutely free. You can use it for as long as you wish to. There are no limits there. You are welcome to use it to identify your trading style resulting in a trading pattern that will meet your needs. The virtual default balance amounts to USD 10 000 (or equivalent in your local currency), and you can top it up (also, for free) by additional USD 10 000. If you require a specific amount (for instance reflecting your “lucky number” i.e. 148), you can ask our support team to do it for you. As I mentioned before, the graph on our platform is the same, genuine and free from any manipulation or tampering. If this ever happened we would lose our license. You have already mentioned new products. As far as I know, until recently binary options had been the only product offered by IQ Option. Can you please name all of the trading instruments IQ Option has now? Anastasia: Surely, I can. What we did first was binary options, a fascinating trading instrument allowing you to trade without buying a stock. Let´s say you expect that a particular asset is going to plummet within the next two minutes. If you had shares of this asset you would sell them to earn plenty of money. However, you do not have the shares. Binary options let you make this trade in the form of a contract to receive a fixed amount of money (displayed in per cent at the website of IQ Option). All what you have to do is to choose an asset and the size of your investment. Next, you must choose the direction in which you believe the price will move based on the charts and technical indicators you normally use in trading. Then you select an expiration period and – go ahead. If your estimate is wrong you will lose all the investment. If you are right you will get a fixed profit (More about binary options). Digital options vs. binary options – it’s like two cousins. What you have to do in this case is to choose an asset and the direction in which you believe the asset evolve. Don’t forget that in this case each deal is limited by 5 minutes; you cannot choose the expiry time as you wish. The tricky part is that you must choose a strike price (the assets is going to reach) in your mind. So, let’s say you estimate that the price is likely to rise. Well, but how much? The strike price will answer this question. The bigger the distance from the current price, the bigger your potential gain (IQ Option offers the maximum of 900% per investment). The bigger the risk the bigger the reward, and vice versa. Because we didn’t want to fall behind in cryptocurrency trading, we added this trading instrument to our portfolio. The underlying idea is similar – to predict the price movement of a cryptocurrency, however, here you will not see any expiration time. It is you who opens and closes the deal using data from your chart to make a decision. Please, remember that unlike traditional currencies, cryptocurrencies cannot be withdrawn from IQ Option. You can use them as an investment only. The last type of trading offered by IQ Option is Forex/CFD, probably the best-known trading instrument. With Forex a trader speculates on the behavior of a specific currency pair. If you believe the market is going to grow you will open a long position. If you think that the evolution will go in the opposite direction you will open a short position. There is no expiration time there either, but what you can use is a multiplier. As the name suggests, the multiplier multiplies your investment. It’s, in fact, a kind of a leverage. Hypothetically, you want to invest $10 per deal, you close the deal and get a $1 profit. However, if you were to use a multiplier of 50, you would have earned $50! Sounds good, doesn’t it? However, remember that the multiplier also carries a risk. If your loss exceeds 95% of your initial investment the deal will close automatically. The multiplier is what affects how fast this will happen in case your prediction is wrong. The good news is, you can never lose more money than you have invested. Hence, if you invest $10 the maximum to lose is the same amount: $10. CFD (stands for Contact For Difference) is another trading instrument having a multiplier that you can use with your investment. The biggest difference between IQ Option’s CFD and Forex is the assets: while with Forex you will be using currency pairs, with CFD it is the different types of Indexes. Wow, this must be pretty difficult. Binary options seem to be quite a simple instrument. But what about Forex, cryptocurrencies and CFD? These involve so many factors one must take into consideration. These all make trading difficult, don’t they? Anastasia: Binary options involve some weaknesses, too. It is hard to perfectly predict how the market will behave in the next minute or two. Forex trading requires more fundamental analysing and the ability to choose the right time to both open and close a trade. 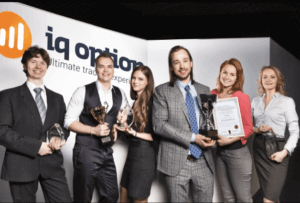 Nevertheless, any competitive individual with inclinations towards financial analyses will find IQ Option one of the best trading platforms. We have designed our platform to be as much user-friendly as possible and keep educating our traders. We provide access to our practice (demo) account without any charges, make video guides and keep our blog up to date. Having established a VIP program, we also have the best customer support in the industry, of which I am proud to be part of. Don’t hesitate to call us whatever you need. We are available 24/7. Still don’t believe that IQ Option is the best broker?